Mayonnaise that tastes like bacon. Does it get any better than this?? I love bacon. It's crispy (or floppy depending on your preference), salty, smoky, and an all round delicious source of protein. And it tastes good on pretty much anything. So when I heard about Baconnaise, I thought it was too good to be true. What a fantastic combination. The creaminess of mayonnaise and the smoky taste of bacon in one mouthwatering spread. Urban myth? Nope - it's real and it's awesome. The company that makes Baconnaise is called J&D's, and it was created by two regular guys called Justin and Dave. They had a dream - to make everything taste like bacon. Their mutual love of this divine pork product drove them to experiment with creating bacon flavored condiments, and in 2007 they produced the first ever bacon flavored salt. Since then, they have gone on to make a range of delicious bacon flavored products including Baconnaise, Bacon Salt, bacon flavored popcorn, bacon gravy, and even bacon flavored envelopes and lip balm. Baconnaise is a rich creamy spread that tastes like...you guessed it - bacon. It is a light orange color, and has a smoky flavor reminiscent of barbecue grilled bacon. Bacon lovers can choose from two versions, regular and lite. Although it may sound like a heart attack in a jar, Baconnaise is actually a lot lighter in calories and fat than regular mayonnaise. One serving of regular Baconnaise has only 80 calories and 9 grams of fat per serving compare to 90 calories and 10 grams of fat in a serving of regular mayonnaise. And the lite version is even less with just 30 calories and 2.5 grams of fat per serving. 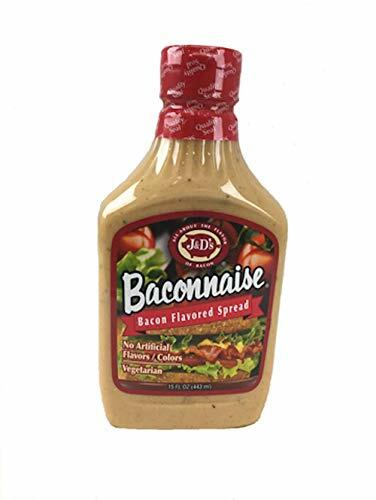 For those watching their diet, Baconnaise is a great way to enjoy the taste of bacon without the artery clogging effects of actual bacon. And there is actually no bacon used in the product, so it is safe for vegetarians who want the bacon flavor but not the meat. What Can You Use Baconnaise On? This smoky, creamy spread can be used on anything that would benefit from the taste of bacon. Sandwiches taste great with Baconnaise, as do hamburgers, hot dogs, chicken wings and french fries. You can even get creative and add it to potato salad, fish sticks, vegetable dips or pizza. I even tried dipping popcorn and corn chips in Baconnaise, and the result was awesome. Really there is no end to the things you can do with Baconnaise. 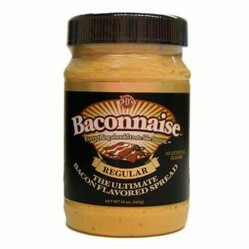 For anyone that loves bacon this is the perfect condiment. But be warned - you may never go back to regular mayonnaise again! Where Can You Get Baconnaise? 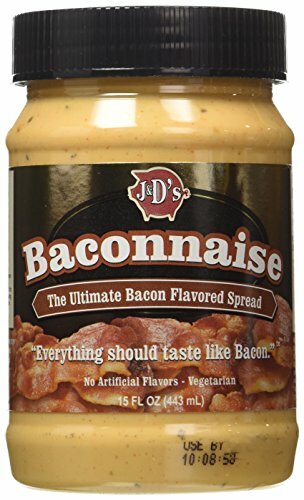 Baconnaise and other bacon flavored products from J&D's can be hard to find, especially if you are not in the United States. Fortunately you can buy many of their products here through Amazon.com. Products can be shipped directly to your home, and there is even a gift wrapping option for those that want to send Baconnaise as the ultimate present for any bacon lover. You are so right - Baconnaise on a BLT is amazing! This sounds sooo delicious. It sounds like a wonderful staple to keep in the house to add on lots of things. Maybe a Bacon Lettuce and Tomato sandwich!